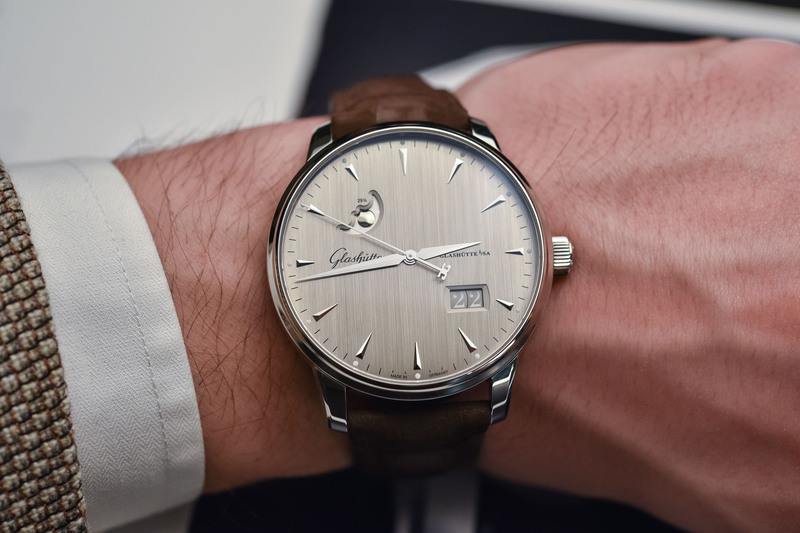 When Glashütte Original works on its style to please millennials. These days everybody’s scratching their heads trying to figure out how to create products that appeal to the “next” generation, aka millennials. Watch brands are certainly not immune to this dilemma and many are making a concerted effort to bring a touch of youth to their more traditional offerings. 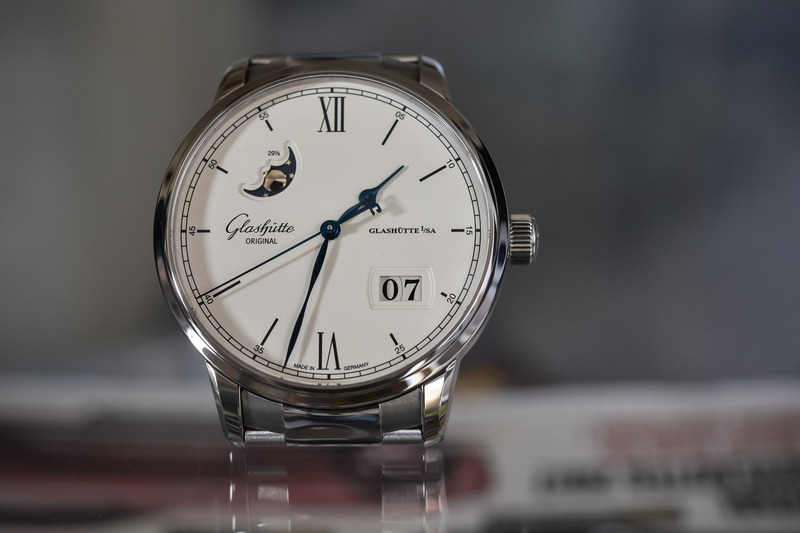 Among them is Glashütte Original. 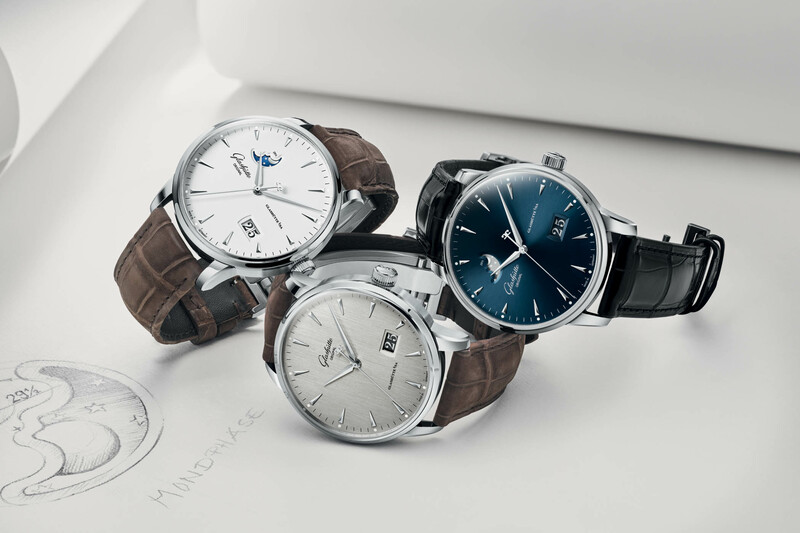 Over the past few years, the German watch manufacturer has been steadily introducing more contemporary versions of its classic models. Granted, not all have been hits but there are definitely a few stand-outs, including the new Senator Excellence Panorama Date and Moon watch that we are looking at today. The Senator Excellence collection is comprised of what I like to call dressy casual watches. 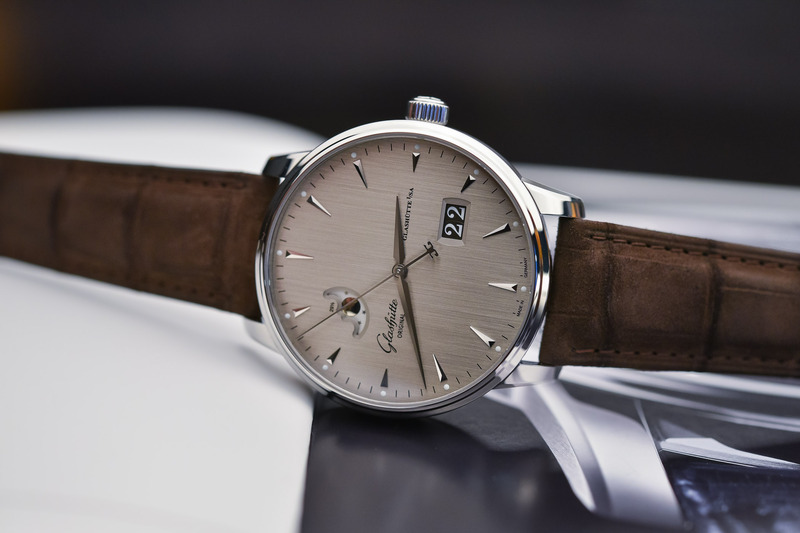 More refined than a sports watch, but not quite as formal as a proper dress watch from the brand, these models are a great everyday option, particularly if you’re wearing a suit to work. 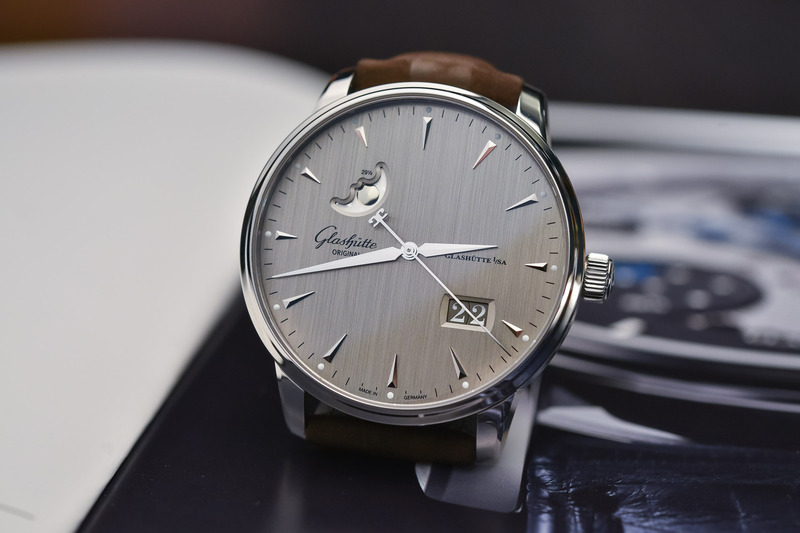 Launched in 2016 (read our coverage here), the Senator Excellence collection was the first (baby) step towards a fresher look for Glashütte Original. The style was still largely traditional; white dials, blued hands, black Roman numerals, however, it was a noticeable change of direction for the conservative German brand. This year, the company has been even bolder with the designs and the results speak for themselves. Available in three dial colours (galvanic blue, galvanic silver-grey, and lacquered white) the new Senator Excellence Panorama Date and Moon looks like an entirely new watch. And in some ways, it is. 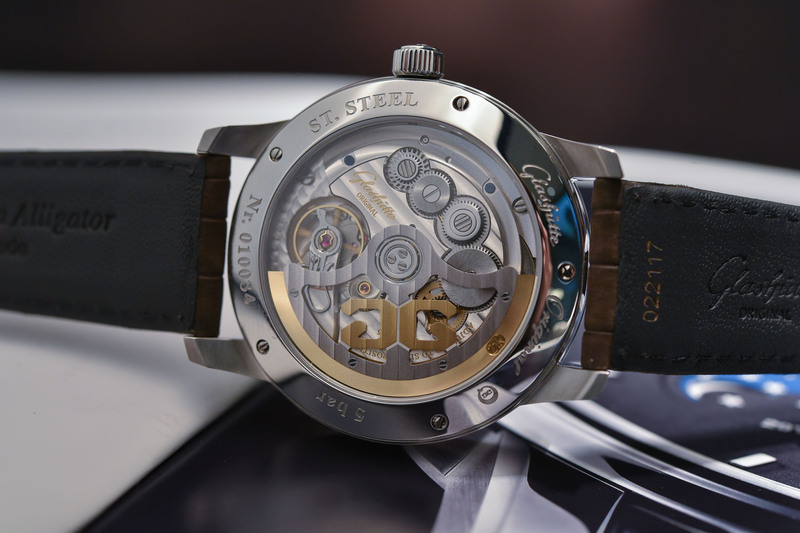 Offered exclusively in steel in a larger 42mm case, it makes its presence known without being uncomfortable. Some people will take issue with the larger case I’m sure, particularly because the more traditional version comes in at 40mm. This is not meant to be a classic dress watch, however, and I think GO has done a good job of differentiating the models. The height of the case remains the same at 12.2mm, meaning it sits nice and flat on the wrist. The real drawcards though are the new dials. 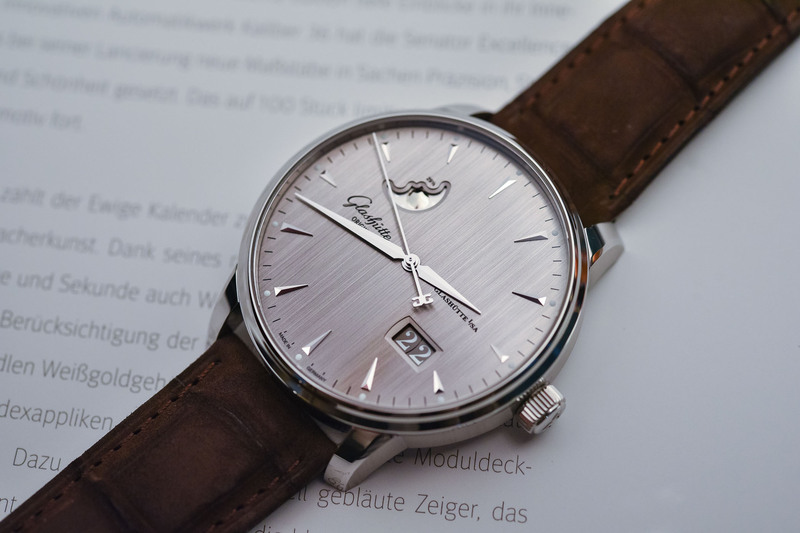 My personal favourite is the galvanic silver-grey dial, which is enhanced by a vertically brushed finish. Contemporary in every sense of the word, its monochromatic style is understated yet eye-catching. 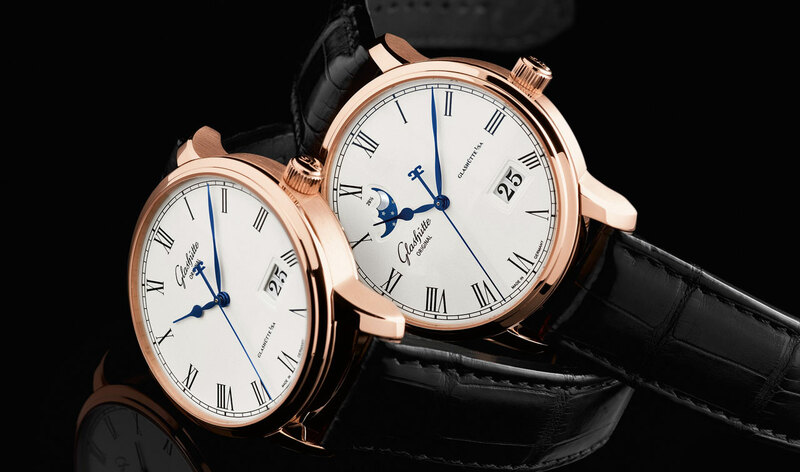 The more traditional blued hands and Roman numerals have been replaced by modern dauphine hands and triangular applied indices with luminous dots, dramatically changing the look of this classic model. It’s still dressy and sophisticated, just in a younger, sexier way. The layout of the dial remains the same. Hours, minutes and running seconds are displayed centrally, while the familiar Panorama date sits at 4 o’clock. On the grey dial version, GO has opted for black calendar wheels, which I think was the right choice. It injects just the right touch of contrast into the dial without detracting from the overall monochromatic aesthetic. Plus, white would have looked plain horrible. Diagonally opposite is the moon phase display, which has also received the full grey treatment. Again, I think this was a smart decision, as a more traditional blue night sky would not fit with this model’s contemporary aesthetic. 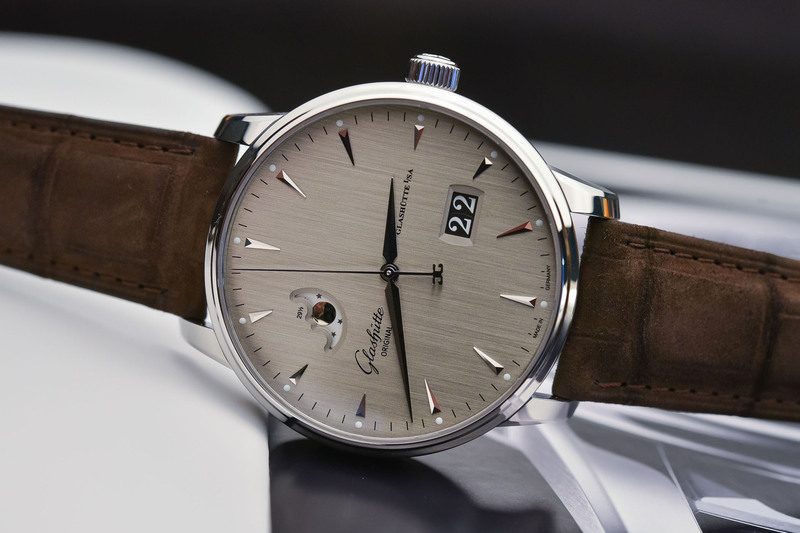 Inside all three versions is the automatic in-house Calibre 36-04. Visible through a sapphire caseback, it offers a healthy 100 hours of power reserve, meaning you can take it off on Friday night and put it back on Monday morning without a second thought. That said, there’s a good chance you’re going to want to wear this versatile model over the weekend too. 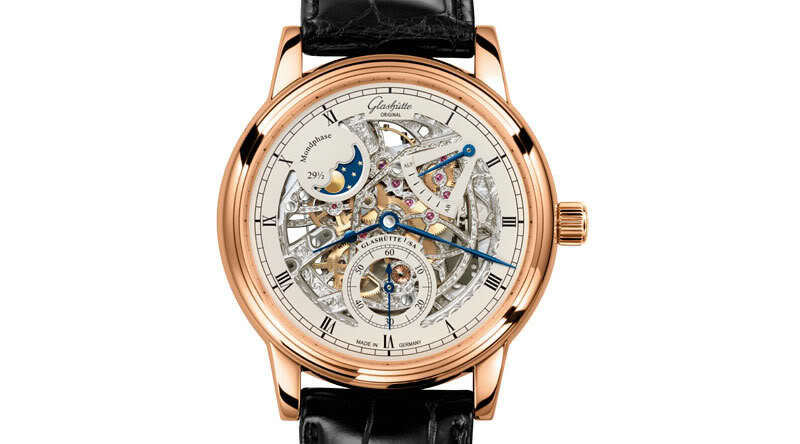 The movement is beautifully decorated and features a Glashütte three-quarter plate with stripe finish, bevelled edges, polished steel parts with perlage, and a skeletonised rotor with its 21k gold oscillating weight. The new Senator Excellence Panorama Date and Moon is available in three dial colours on either a brown or black Louisiana alligator leather strap or a matching steel bracelet. My preference with the grey dial model is for the brown leather strap. It adds that extra bit of contrast and ties in well with the contemporary theme. Pricing is set at EUR 10,200 on leather and EUR 11,700 on the steel bracelet. 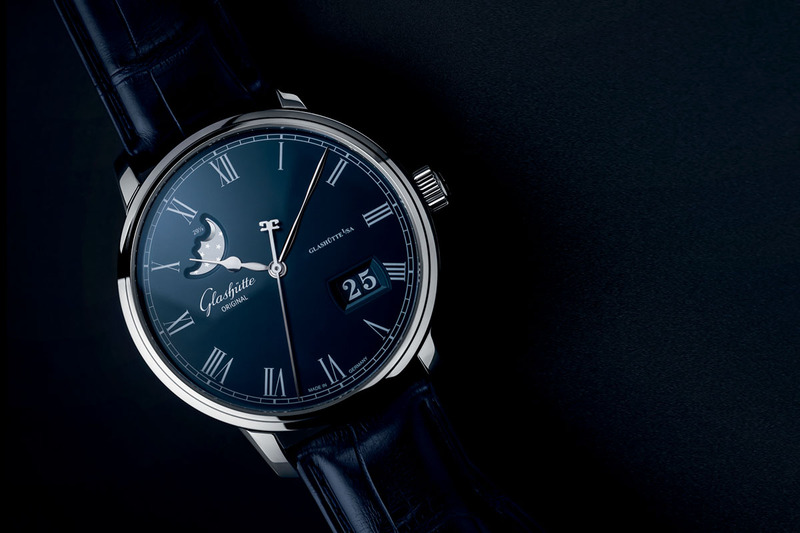 More details on www.glashuette-original.com. I agree with your strap choice. At this price, this is a “serious watch” in anyone’s eyes and normalising a 42mm case with such a tasteful design is very worrying. We have already got to the stage where even many of the WIS community are unaware of WHERE to wear their watch and the number of “is this too big?” threads accompanied by photographs of tiny wrists wearing huge watches on the back of their hands is seriously depressing.